Would be a good addition to a class on ice sheets and melt rates, sea level rise, or general cryosphere studies. Could be used as a jumping off point to have students look into some of the data given here to learn more about the topography of Antarctica, the amount of water stored in the ice, or as a reason to learn more about the cryosphere. This video documents the current collapse and melting of a large part of Antarctica and compares this event to a period of sudden melting and sea level rise after the last ice age ended, and proposes a potential forecast for sea level change in the future. Concise explanation of sea level rise, grounding line retreat, potential for sea level rise to "jump". Historical explanation of noted Meltwater Pulse Event 1A and potential for repeat, hence the title Meltwater Pulse 2B. Comments from expert scientist: Concise and simple summary of the marine ice sheet instability concept that combines expert interviews, model output, satellite imagery and animations. This topic is very significant (arguably most significant) for constraining future sea level estimates, so a very timely and relevant video! 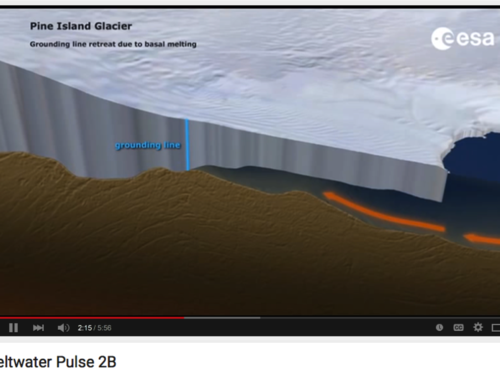 However, the video fails to make the explicit connection between the title (Meltwater Pulse 2B), which is fictitious, and the primary focus of the video, which is recent research that suggests that regions of Antarctica, notably the Amundsen Sea sector, are exhibiting characteristics of marine ice sheet instability. The viewer is expected to make the link between Meltwater Pulse 1A (historic event during LGM deglaciation, ~14k yrs ago) and the expected increase in ice discharge/sea level rise in the next 200 years from Antarctica. I think this will be missed by many students. Furthermore, Meltwater Pulse 1A, while caused by ice sheet disintegration, likely came in a couple forms: i) increase ice discharge/iceberg calving and ii) massive floods. The latter is unlikely to be associated with marine ice sheet instability concept presented here. I still think this video is useful and can be utilized but the teacher needs to be aware of these points and make sure the video is put into proper context. This would support lessons on cryosphere, sea level rise, ice melt, or feedback loops. Background information is essential to provide context for the video. No educational resources (e.g. teacher & student guide) are provided here. Additional video resources are available from Yale Climate Connections (this is one video in a series of videos). Video length is 5:56 min.